The good, the bad, the ugly-garden beetles! The good, the bad, the ugly – Garden Beetles! Fountain Rock Park & Nature Center grounds have garden beetles. Your park is just like most residences with gardens –beetles abound around garden plants, flowers and trees. Garden beetles can be grouped into good for the garden beetles and bad for the garden beetles. And then there are the plain ugly garden beetles. What are good garden beetles? They are the beetles that help your garden grow by eating other garden pests, such as aphids, that hurt your plants. Good garden beetles include lady beetles ( better know as lady bugs). Good garden beetles include some colorful beetles that children love to find. The six-spotted Tiger Beetle (bright green with six white spots) and the Fiery Hunter Beetle are a couple of fun beetles to find in the garden. What are bad garden beetles? As the “bad” implies — these beetles are the ones that hurt your garden plants by eating the plants or otherwise damaging the plants. The spotted Aspargus Beetle, Corn Rootworm Beetle and Squash Beetle are a few of the bad garden beetles. Many bad garden beetles are named for the plants that they eat. Finally, the ugly garden beetles. The Swamp Milkweed Leaf Beetle and the Skeletonizing Leaf Beetle both have names and appearances that just seem to put them in the ugly garden beetle grouping. The Swamp Milkweed Bbetle looks mean and nasty with its back a reddish color having a black splash in the middle. Ugh – ugly! The Skeletonizing Leaf Beetle looks kind of like a bug version of a Skelton. Creepy! Want to know more? Stop by and visit our friendly staff and volunteers at Fountain Rock Park & Nature Center. They will be happy to answer any questions. Fountain Rock Park & Nature Center has an exhibit of live Vietnamese Walking Stick insects. The Vietnamese Walking Stick insect exhibit is used to teach visitors about walking stick insects. The Vietnamese Walking Stick is a species of the family Phasmatidae. Originally from Vietnam, many Vietnamese Walking Sticks are now bred in captivity. Their diet is mainly leaves such as oak, maple, hawthorn and others. One of the first things children notice is how much the Vietnamese Walking Sticks look like “sticks”. They tend to grow to about 4 to 5 inches long and cling to the side of the exhibit aquarium. This makes it easy for visitors to see them and watch them move about inside the aquarium. Often, if the Nature Center is not too busy, staff will take out one of the Vietnamese Walking Sticks and allow visitors to hold them and examine them up close. 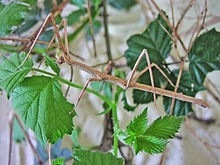 The Vietnamese Walking Stick has a short life span of about 5 to 7 months. Their ability to blend in with their surroundings helps them to avoid being eaten by birds and other mammals. While Vietnamese Walking Sticks make a good exhibit to study and learn about insects, they are not good to have as a pet. Why? Well walking stick insects can become invasive pests and eat important agricultural products if they escape or are let loose. Fountain Rock Park & Nature Center has a variety of trees on the park grounds. The trees provide shade for visitors and a habitat for birds, insects and some animals. How many trees are on the park grounds and what type of tree are they? We do not have a complete inventory or count of trees at Fountain Rock Park. But we do have some volunteers working on it! When you visit Fountain Rock Park & Nature Center you will notice that some of our trees do have small signs to tell you what type of tree you are seeing. One of our volunteer Maryland Master Naturalist Interns is working on a project to identify and place signage at more of our trees. It is a slow process, but it is important to properly identify the trees on the park grounds. 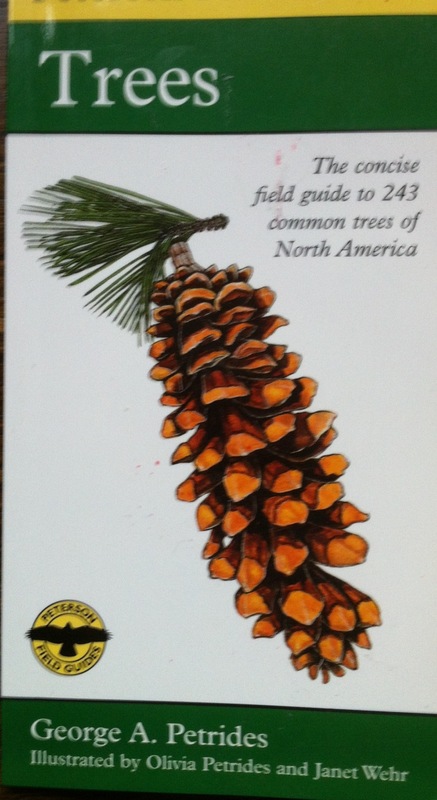 There are many books to assist with identification of trees. One pocket guide that is handy is the Peterson First Guides – Trees. We do have a large Elm tree. Many Elm trees in Maryland, and the United States in general, have died due to Dutch Elm disease. Dutch Elm disease is spread by some bark beetles and kills the Elm trees. Other trees at Fountain Rock Park include several types of oak trees, box elder trees, maple trees and many others. Fountain Rock Park might be getting some American Chestnut trees to plant on the park grounds in the near future. Please watch this blog for details on the Chestnut trees. Want to know more? Please stop by the Fountain Rock Park Nature Center during it’s open hours on the weekend and ask one of our knowledgeable park staff or volunteers. They will be glad to answer any tree questions you might have. The Nature Center is open from 10am to 4pm on Saturdays and from 1pm to 4pm on Sundays.